We're working hard to make Albury a city we're all proud to call home. Here's some of the projects we're working on that will not only enhance our city's liveability but will help us deliver on your aspirations as outlined in Albury 2030. This multi-million dollar project will provide spectacular riverside experiences including boardwalks, a floating dock, car parking, lighting, landscaping and new pathways along the river’s edge behind the Albury Swim Centre. Albury City Council recently received $2,021,947 million as part of the NSW Environment Protection Authority’s Major Resource Recovery Infrastructure Grant Program. Upgrade and expansion of the Wood Fired Oven at Hovell Tree Park. 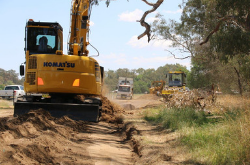 Construction of Stage 5 of the reconstruction of Kerr Road, Thurgoona has commenced in January 2019. This major redevelopment will transform the Lavington Sports Ground into one of regional Australia's premier sporting facilities. A project that aims to treat the leachate at the Landfill to a level that will allow the treated leachate to be discharged to the local sewerage system. We're giving our Kidspace at the library will a welcome makeover to add colour and flexibility with a focus on improving interactivity. We'll soon start extensive landscaping works as part of a long-term plan to upgrade and beautify Monument Hill. The project is part funded by Stronger Country Communities Round 1 funding and involves the construction of a district level play space at National Foresters Grove. Improvements are underway at Noreuil Park Foreshore. Stage 2 works have commenced and include an expansion of the carpark and additional pathways. The construction of a new area will have a capacity in excess of 100,00 cubic metres, meaning that waste can be continued to be disposed of for a number of years. Stage 2 extensions to Oddies Creek Park Play Space in Albury. We've secured $1.3M from the NSW Government’s Regional Cultural Fund to upgrade two residences to improve the city’s artist accommodation and to transform the heritage listed Pump House at Water Works into a Maker Space. In early 2015, AlburyCity adopted the QEII Square Master Plan, a long-term vision to create a contemporary, vibrant and exciting inner-city space for a growing and future Albury. Taxiway upgrades will improve Regular Public Transport and General Aviation efficiencies by reducing take-off and landing delays through the improvement and additions of runway entry and exit points. We're working in partnership LMS Energy and Joule Energy to install 4,000 solar panels at the Albury Waste Management Centre which will produce enough energy to power approximately 400 homes. We're working towards a cleaner, greener and more energy-efficient future by replacing our street lights with state-of-the-art LED lighting. This project will result in an additional 12kms of sealed pathway extending behind Wonga Wetlands. Works are underway and when complete, the trail is expected to be one of the city's greatest assets for both locals and visitors to Albury. Construction of a visitor education and experience centre at Wonga Wetlands as part of the Regional Growth, Environment and Tourism Fund - Murray River Experience Projects.